Elections and politics are a very serious matters. Sometimes too serious. Sometimes even deadly serious. Political advocacy can all too often paint bleak pictures of pessimistic current and future realities. Negative campaign advertising can take its toll on not only the candidates themselves, but the greater public as well. Any manifestation of levity or curiosity will bring a welcome respite from the more colorless and antagonistic aspects of an electoral campaign and politics at large. The items in this featured exhibit were doubtlessly intended to demonstrate the lighter side of political campaigning. This exhibit includes Political Memorabilia that has comical and satirical value. Although many of these items may seem light hearted, they hold some underlying meanings about the poltical candidates. This includes controversies about their candidacy, as well as promotional tactics. In this exhibit you will find items like Donald Trump illustrated as excrement and Ronald Reagan as Rambo, from the pop culture film, "Rambo: First Blood." Prepare to be amused and while you are at it, check to see if we caught all of their underlying meanings! 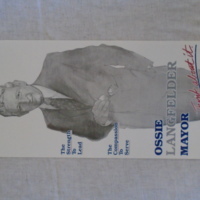 Ossie Langfelder served two terms as mayor of Springfield, Illinois from 1987-1995. Langfelder, won election as the Democratic candidate in the election of 1987, as the first mayor under the current form of government. Born in 1926, the Langfelder family escaped Austria when Hitler invaded in 1938. The family moved first to the United Kingdom, before settling in the United States in 1940. Langfelder served in the US Army at the close of World War Two, as well as during the occupation of Japan. In Springfield, Langfelder worked as an engineer, before serving as Streets Commissioner and then Mayor. This collection brings together pieces of the past, important to the service of Ossie Langfelder to Springfield, Illinois. Included in this collection are promotional materials for the campaigns, shirts, stickers as well as a pen. Also a part of this collection are scans of letters and documents related to Langfelder as well as a caricature of Ossie. During Langfelder’s first campaign for mayor in 1986 the first item of the collection was produced in order to promote key issues that Langfelder wanted to highlight. Second item in the collection is the newspaper headline from the re-election victory. After his time in office Langfelder continued to be a powerful force in Springfield politics, and he was often sought out for endorsements and photographs. The third and fourth items in the exhibit relate to Langfelder’s continued political influence in Springfield during the years after he left the mayor’s office. The final section of the exhibit collects examples of the ways that the Langfelder campaigns used material culture to connect to the public. 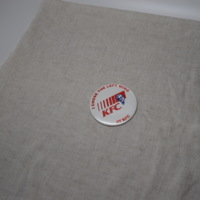 Shirts, pins, stickers, and other items were produced by the campaigns in order to be effective connecting the candidate to the people of Springfield. Ultimately these items were effective as Langfelder won two elections for mayor. The items in this exhibit were brought in by the Langfelder family, memories of their father and his service to the people of Springfield, Illinois. Richard Nixon is one of America’s most recognizable presidents. But, unlike the other few who share this title, Nixon is often not remembered for his work as a politician. Ask anyone who Richard Nixon is and they might say, “That’s the Watergate guy, right?” While he was indeed guilty of illegal activities and deserves many of the harsh criticisms historians and the public have placed upon his legacy, Nixon ran successful campaigns for Congress and twice for President in an era when American politics and its relationship to the public was experiencing a major shift. What surprises many, “Nixon, son of a western farmer and grocery-store owner, had struggled his way up, working through college, living sparely in a garage apartment. His story reflected the idealized ‘American Dream,’” resembling many aspects of Abraham Lincoln’s rise. 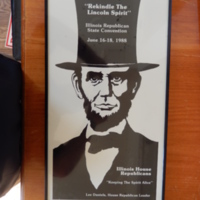 Nixon sometimes referred to Lincoln in his speeches. First serving in Congress (in both the House and the Senate), then as Vice President to Dwight D. Eisenhower, Richard Nixon had a successful career. Despite his early success, his public image began to falter starting with the first televised presidential debates during the 1960 election. Richard Nixon appeared disheveled and sweaty, his opponent John F. Kennedy was more “camera ready.” Young and energetic Kennedy defeated the experienced Nixon by a slim margin. He then unsuccessfully ran for governor of California in 1962 against incumbent Pat Brown. Finally, in 1968, amid an intensified Vietnam War, heated protests at the Democratic National Convention, and the assassination of two influential public figures (Martin Luther King Jr. and Robert F. Kennedy), Richard Nixon defeated Hubert Humphrey for president. He ran for reelection in 1972 defeating opponent Georger McGovern in a landslide. Unfortunately, shortly after his election, the Nixon administration began cover-ups for the break in at the DNC headquarters in Washington D.C. In 1974, after an FBI investigation and an intense court battle, Richard Nixon resigned the presidency. Richard Nixon is a nuanced figure in American history who, like the Founding Fathers and those assassinated shortly after reelection, is reduced to a one-dimensional figure (although Nixon is remembered for his faults rather than his successes). By focusing on his initial campaign and his bid for reelection, we look beyond the scandal-doer and highlight a few distinct aspects of the work and successful campaigns of the 37th president, Richard M. Nixon. 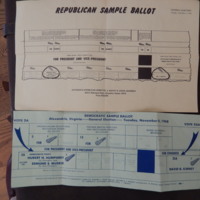 A sample ballot for the 1968 election marks the starting point of the exhibit and gives a general background to the time. We then turn local, showcasing a photograph of Richard Nixon in Springfield. The posters - for the 1972 election and "Coolness" - and the button collection serve to highlight issues that have always haunted Nixon: The public's views on his person and a slightly paranoid handling of the press. The "War on Drugs"-pamphlet retells one aspect of Nixon's politics that would prove very long-lasting. We conclude the exhibit with a look at the eventually unfortunate duo "Nixon/Agnew", as neither of them end up leaving office gracefully. American citizens have a long history of joining the fashionable and the political in order to convey ideologies to those around them. Today it is a common occurrence, especially during elections, to see individuals wearing campaign shirts, hats, or buttons. The five items in this exhibit are examples of how citizens promote their candidates during elections, local and national. Wearing these items may seem like a recent concept, but Americans have been using clothing to convey their personal beliefs since colonization. In the decades, leading up to the American Revolution fashion became simplified, not just out of necessity, but also as a social commentary on the changing ideals of independence and equality.Patriots embraced these changes in clothing by promoting homespun, local fabrics as a way to maintain autonomy from foreign manufacturing and in essence, the monarchy. The history of campaign paraphernalia goes back to George Washington, when sew-on-buttons were manufactured to commemorate his 1789 inauguration. The election between Andrew Jackson and John Quincy Adams in 1828, forty years after Washington’s buttons, is hailed as the first presidential election where both men appealed to citizens on a national level. Jackson’s strategy was to hold events and give out campaign trinkets such as medals and snuffboxes. 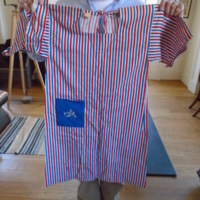 This tradition continued and only gained popularity among politicians and citizens in all levels of government, which can be seen in the wide array of political clothing within this exhibit. Wearing campaign material is a way to endorse a particular candidate as well as displaying membership to certain communities, which can be advantageous for politicians when they want to promote their own social inclusivity. This is most apparent when politicians pander to certain demographics, as evident with the LGBT themed shirt in this exhibit, which features the Bernie Sanders logo in the recognizable LGBT rainbow, sold during his 2016 presidential campaign. Building communities are most evident in local elections, where clothing is given out to residents of districts and cities. In smaller communities wearing politicized clothing has even more power because there are often personal relationships with the candidate as seen with the Springfield, Illinois specific Langfelder Family items as well as the jacket worn by Mrs. Hunter during her husband’s 1978 campaign for the U.S. House of Representatives. The act of providing campaign items has become a lucrative trade during elections. Not only are politicians able to market their candidacy by creating logos and catch phrases but by wearing these items citizens show their allegiance as well as promote their candidate. With the expansion of online shopping, Presidential candidates have been able to benefit from selling their own trinkets, usually returning the income to their campaign funds. This was pioneered by Barack Obama’s campaign, with the sale of merchandise earning the President’s 2012 bid for re-election, 40 million dollars. Clothing as a means of political expression is such a powerful tool in America that in 1992 the Supreme Court ruled that allowing election merchandise to be worn at polling places was a means of voter influence. Citizen’s sartorial choices will always be an important aspect of elections and society. Even without candidate specific apparel, the “I Voted” stickers provided at polling places are enough to politicize any outfit, proving to others the fulfillment of one’s civic duty. African-American history in Illinois has been similar to the rest of the country; challenging and difficult with many roadblocks along the path to equality. What makes it unique here is Illinois' unique position between the North and the South and its relationship between its rural and urban citizens. One cannot estimate how far African-American rights have come in Illinois without looking at the extreme difficulties they have faced. Nowhere in Illinois has this been more obvious than with the 1908 Springfield Race Riot. African-American homes and businesses were burned and destroyed causing many to leave Central Illinois. The African-Americans who remained there persisted through this difficult time, even 50 years later when racial tensions were high in the South over the Montgomery Bus Boycotts. A reprint of an article from Alabama in the Decatur Newspaper certainly shows how widespread the issue was. 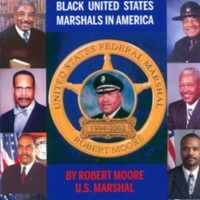 The Springfield Race riot, bus boycott and the story of Marshal Robert Moore present an enduring African American struggle for advancement. Racism and ethnic prejudice are significant problems in our society as they are troubling and potentially catastrophic. In most cases, peaceful protest and violence occurred to break free from racist mentality. Out of the race riot at Springfield had come the organization of the first effective black protest. The N.A.A.C.P focused the national attention on these incidents, points the finger of scorn, and bring the black discontent to the open. Finally, one can see how far African-American rights have come in Illinois with a great example of Robert Moore. Examining these issues is essential in order to ensure we do not repeat the mistakes of the past. If you, root, root, root for the Cubbies, watch the Chicago Bears play on a Sunday afternoon, cheer on the Fighting Illini, or watch the Blackhawks dominate, you may be a true blooded Illinoisan. Sports and recreation are a big part of who we are as natives. Families come together to spend time with one another while enjoying a game or attending a school event. Like many states, our roots lie in our native sports stadiums, because that is where we watched our heroes defy the odds, break records, and follow their dreams. This exhibit includes small-town and professional sports teams and memorabilia. While also including high school and small-town recreation. These items all tell a story, they all have a past, and they hold great importance to Illinois history.